Can't believe it's taken me this long to talk about the 2010 House of the Year by Country Living. Better late than never, right? I won't recap the entire house, because I'm sure it's been done already, but there are a couple of great tips that anyone could use in their own home. -If you are scared of bold wallpaper doing it in a small dose is the way to go. It won't require that much paper and if you hate it after a little while it won't be too bad to remove and repaint. Plus I think doing such a fun paper adds a touch of whimsey to your space and let's all of your guests know you are cheery! Design Your Wall has lots of good wallpaper options. -The cabinet and bench area can easily be recreated with a trip to IKEA & Home Depot. Purchase either a storage piece with a door or go with opening shelving and add baskets to hide clutter. A trip to Home Depot for some wood and supports can have you on your way to mini mudroom/entry way in minutes. -If you don't have a separate entry way that you can wallpaper ( Like me), but you still want the impact of some patterned wallpaper head to the ceiling! I love this idea and have for quite some time. I recently wallpapered one of my ceilings in grass-cloth and I love it. It's always fun to see visitors notice it for the first time! -New take on patterned upholstery. Love how the solid dining room chairs have a touch of pattern with the help of a stencil. I think this is a great solution for households where one member dislikes flowers. (Totally talking about Jon here) It would be much harder to talk him into something full of florals, but one bloom is something he can handle. 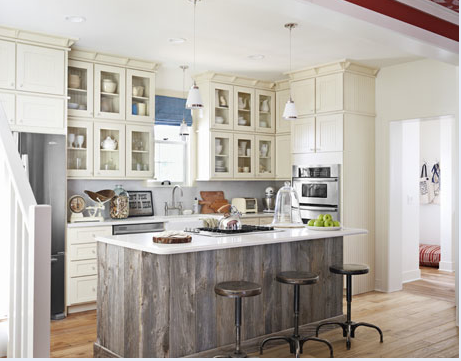 -Have a builders grade island or a rolling cart in your kitchen? Add a custom flair with pennies. To recreate the look above I would head straight to pallets that I could take apart and stain like we did on our brickmaker table. A little liquid nails for application and voila a cheap & chic custom look. If reclaimed wood is not your thing then add some bead board wallpaper or just paint it a contrasting color. Tips for painting cabinets available here. -Switch out your stools. Many rolling cart islands that you purchase come in a set with wooden stools. An easy revamp is switching those out for something more your style. You know I went with lucite in my kitchen. For an industrial look these have always been a favorite. -Way to take a normally forgotten space and make it jaw dropping. They used Art Forms in Nature (Only $10 for 100 pages) and then framed them up. Can't get more budget friendly than that. -My go to source for inexpensive, but nice frames with mats is Walmart. I love their Canopy line. They sell there 8 x 10 frames in sets of 4 for $39.84! I love IKEA as well, but sometimes their sizes don't work out for me. Did you have any favorite rooms from the 2010 House of the Year? this home is truly fabulous! I LOVE the beadboard wallpaper link that you posted-- I am thinking of pasting this to my kitchen island.... right now I have plain wood under my bar area.... I think this would be an easy fix! Is it just me, or is Country Living just so great lately? Obsessed with the gallery wall! 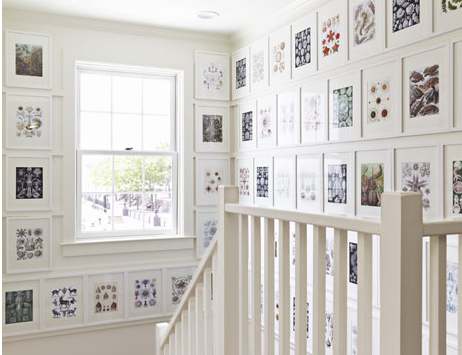 I need to do this with my stairway and I love the tip on Walmart frames. I feel a project coming on! LOVE. SO many wonderful ideas! so inspired! absolutely smitten!